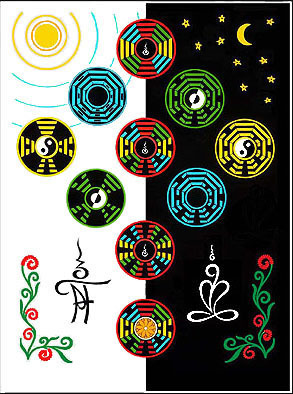 I CHING, or book of changes. Originating in the dawn of history, it is a common source of Confucian and Taoist philosophies. It identifys the continuous changes of all existence. The prose between the symbol and name is by Claus Furstner. *10 Represents the completion of the cycle and entering the next. I knew nothing and was happy. I know now, but not enough. Man - mind. Wanting - more. Between two poles a spark. Between two mountains a river. I CHING.TREE & KEY by C.F. The progression of octograms "nine year cycles" as they proceed through the formative years, "day" and digestive years, "night". M - Stands for the Causal vibration. A - Stands for the first sound of Life. N - Stands for Now and Eternity. U - Stands for Memory and Anticipation.